32% of likely Democratic primary voters said Biden was their first choice for the nod to take on President Donald Trump, including 34% of Democratic women. Those figures are down just 1 percentage point from last week’s tracking survey. The share of Democrats who view Biden very favorably is down 6 points from the prior survey. Allegations by multiple women that former Vice President Joe Biden touched them in ways that made them feel uncomfortable struck a nerve with the political chattering class, but it has not yet changed the minds of a key constituency in the Democratic coalition: women. According to Morning Consult’s latest 2020 tracking poll, 34 percent of Democratic women said Biden is their first choice for the party’s nomination to take on President Donald Trump next year, down 1 point from the previous week and within the surveys’ 1-percentage-point margins of error for that subgroup. That lack of significant movement in Biden’s first-choice support was matched by the top-line numbers in the latest nationwide survey of 13,644 likely Democratic primary voters, conducted April 1-7. Thirty-two percent of the voters surveyed said Biden, who continues to signal a forthcoming presidential campaign launch, was their top pick, compared with 33 percent a week ago. It was also reflected among Democratic women of all ages. Biden continues to hold an edge over the rest of the potential field with women 45 or older, while Sen. Bernie Sanders (I-Vt.) — the first-choice candidate for 23 percent of voters in the survey — has stronger support from women ages 18-44. Forty-four percent of Democratic voters in the latest Morning Consult/Politico survey said they heard a lot about the stories regarding Biden’s physical contact with women, including 47 percent of Democratic women and 39 percent of Democratic men. And while it does not presently appear to be costing him support for the nomination, the Delawarean has seen his standing among Democratic primary voters soften. The share who said they had a “very favorable” view of Biden fell 6 points in the past week, and is down 11 points since early February. 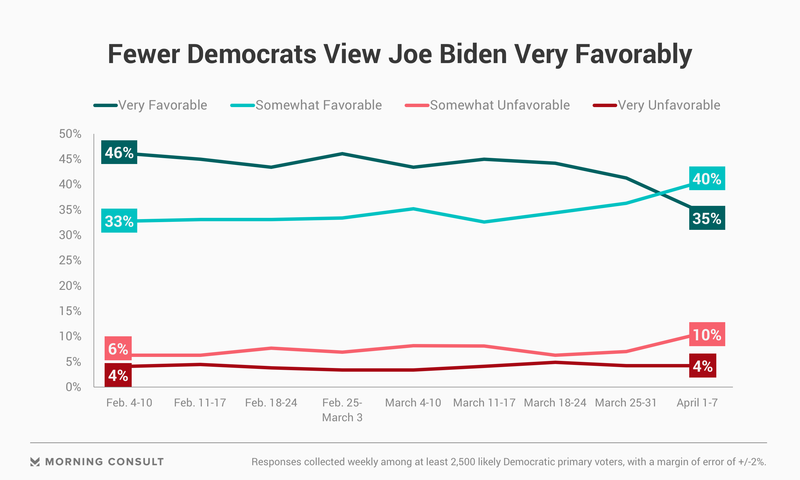 Overall, three in four Democrats said they had favorable views of Biden, compared to 15 percent who viewed him unfavorably. That’s his lowest net favorability since Morning Consult began tracking the metric in January. The latest poll was the first to include Ohio Rep. Tim Ryan, who announced his candidacy for president over the weekend, and businessman Andrew Yang. Support for both was marginal (around 1 percent). South Bend, Ind., Mayor Pete Buttigieg continued his rise in the weekly polls, securing 5 percent of the vote as more voters have learned who he is. That marks a 2-point increase from the previous week, placing him behind Massachusetts Sen. Elizabeth Warren. Want more 2020 data? Get the weekly Political Intelligence Briefing.